Toshiba has recently announced an upgraded version of the prior Toshiba Camileo, the Toshiba Camileo Pro that features 7 megapixel sensor, an 2.5 inch wide LCD display, 3x optical zoom, and 64MB of internal storage. Without question, you also can expand its memory by external high-capacity SD (Secure Digital) memory card. The compact, sleek and light weight Toshiba Camileo Pro digital video camera is measures at 118.8 x 60.5 x 30.5mm and weights at only 200g. 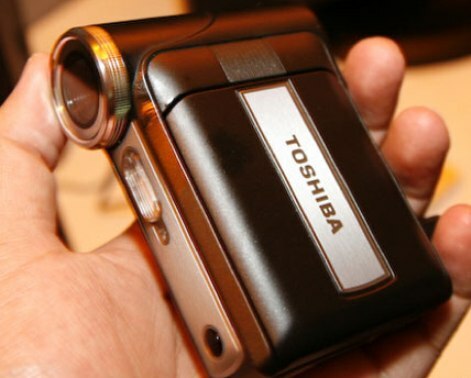 The Toshiba’s multi-purpose camcorder can capture (640×480) MPEG4 video in AVI format. In addition, this video camera also can serve as a webcam through a supplied USB cable and a tripod for stabilizing purpose. The Toshiba Camileo Pro will be released in Europe by September for around Euro199€ ($268) but no words of other areas release yet.